Did the ancient Mississippi River ever flow in a different direction? That and other questions about what Native Americans named the “Father of Waters” may soon be answered, thanks to new research being conducted by scientists at the University of Mississippi. Thomas Varner, a senior geology and geological engineering major from South Bend, Indiana, and Jennifer Gifford, assistant professor of geology and geological engineering, are studying zircons (extremely durable heavy minerals often found as detrital grains in sedimentary rocks) to determine the river’s age and tectonic environment of origin. The project, funded by an internal UM Undergraduate Summer Research Fellowship Track 1 grant, uses detrital zircon age patterns as a tracer of sediment source. Before applying for the Undergraduate Summer Research grant, Varner and Gifford collected samples of the target unit, the McNairy Sandstone, from northeastern Mississippi and south central Tennessee. 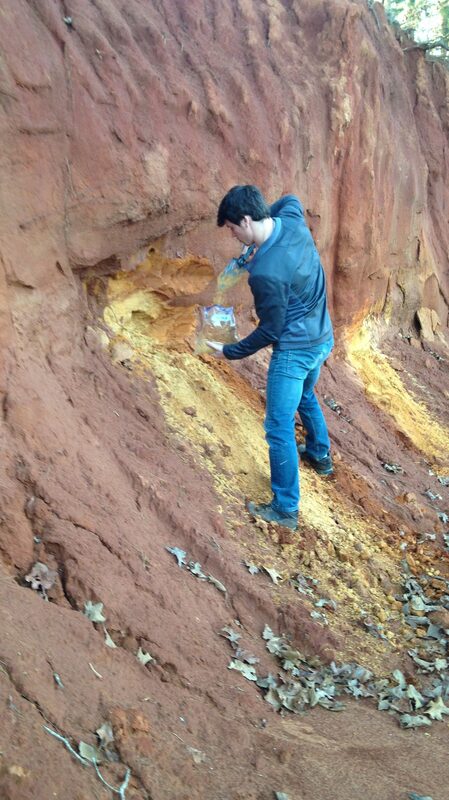 Two gallon-sized bags of samples were collected at each of 10 sites, predetermined outcrops of the McNairy formation. Notes about the specific location, sample lithology and details of the outcrop at each site were recorded. Throughout the spring 2018 semester and through the summer, the pair continued to work on the project. The ICP-MS ionized a portion of the individual zircon grains, which was then analyzed for uranium and lead isotopes to calculate an age for each grain. Now that the age spectra for each sample have been obtained, Varner is working on interpreting the provenance of this section of the McNairy sandstone in comparison to that which is exposed in the Illinois Basin. He will present the findings of their study at the annual Geological Society of America scientific conference in Indianapolis in October. One previous detrital zircon study of Maastrichtian sandstones in the Mississippi Embayment provides important insight into the nature of depositional systems along the southern margin of Appalachia during latest Cretaceous time following the closure of the Western Interior Seaway. This project furthers another geographical study in which a major change in the dominant drainage trajectory of the ancient Mississippi River in the late Cretaceous, from west-flowing across the continent to south-flowing to the Mississippi Embayment, was observed. By analyzing further detrital zircons along the trend of the Mississippi Embayment through Mississippi, Tennessee and possibly Kentucky, Gifford and Varner hope to determine exactly when the Maastrichtian sediments were deposited during one (or more) of these transgressive cycles.